﻿ Four person Electric Surrey Bike,Electric 4 wheels Quadricycle for 4 person. "Four-person Electric motor Quadricycle" is designed for commercial use. 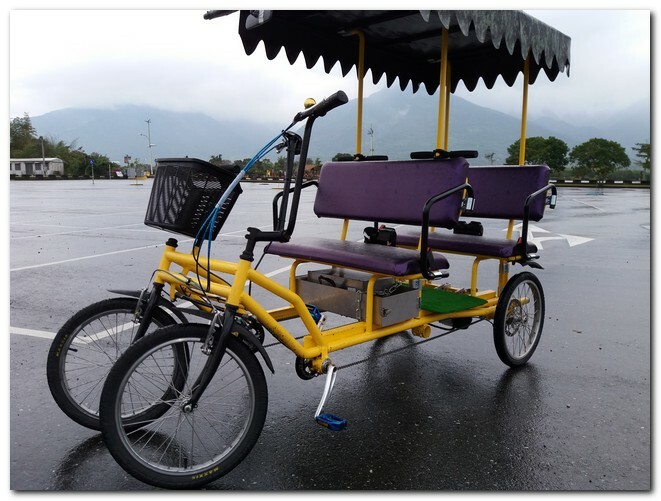 Before we start to design a vehicle of “Four person electric surrey bike", two individual bicycles to be combined as one car and be able to carry 4 persons simultaneously will be a good idea for this project. A four-wheels bicycle is just like a car, it might meet the purpose: family or friends sit together, chat together and have fun together. For elder persons, this car might be friendly too. With the base of quad wheels bicycle, we install a motor, a LFP battery, a control system. So here comes a “Quadricycle electric surrey bicycle”. Safety and simple operation are our most concerns. For those people who are running a bike rental shop, don't let the cruising endurance and control system concern you. Rental shop owners hate troubles most. 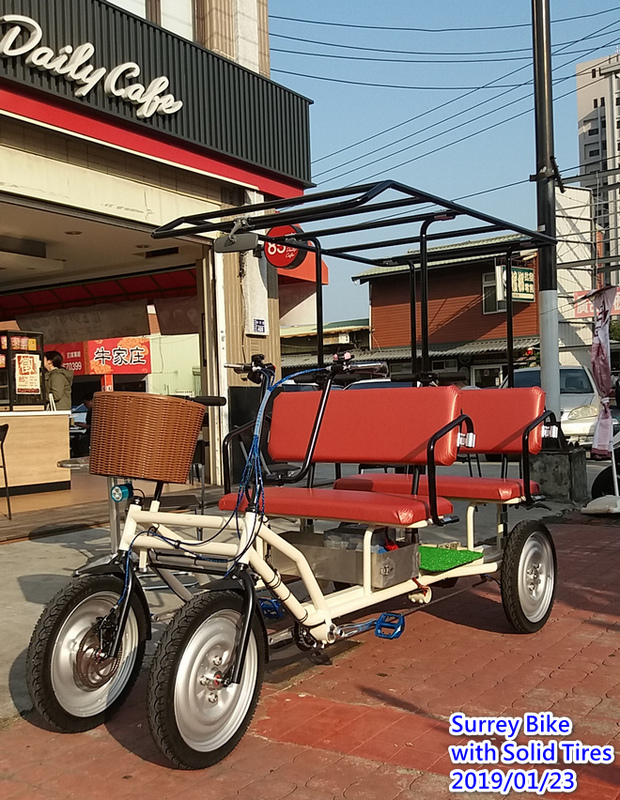 A vehicle such as “Electric Surrey Bike” helps them to lure customers and make money. It will be a perfect matter if this electric vehicle can use all day long without changing battery. Yes! Our electric surrey bicycles can do that! Normally we drive surrey bike at 15km/h with 4 adults carried. According to our experience, the running distance is up to 90 km by using only one battery. Motor-powered and man-powered is switchable. There is another advantage for this electric surrey bicycle, that is people can ride the bike back if this vehicle ran out of battery. And we might say there is no competition from other electric cars if you are talking about this benefit. Somebody might ask: For the same surrey bike, can we use “electric power” and “foot stepping pedal” together? Sure! No problem at all! Our electric bike quadricycle can use battery power with man-powered foot stepping at the same time, and they can be used separately also. 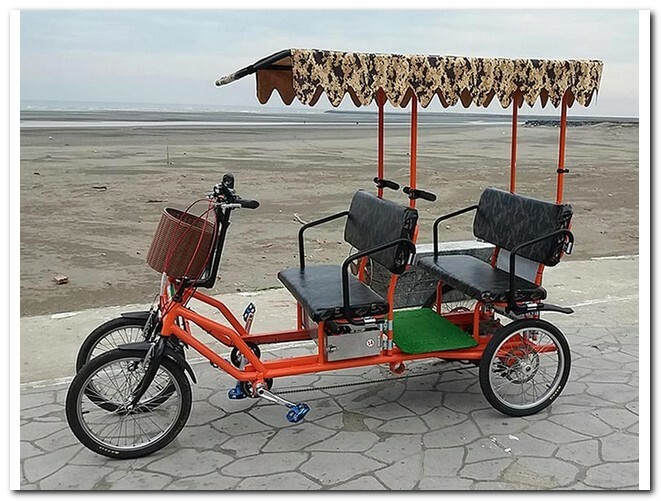 This "Four person Electric Surrey Bike", may also be called as "Electric Quadricycle", "Electric Four-wheels Bike for 4 people", "Electric Surrey Bicycles", "Electric Sociable Bike", "Electric Buddy Bike", "Electric Sightseeing Bike Quadricycle". The electric surrey bike is not a new-fangled idea, we just simply combine several components on a quadricycle, they are DC motor, Control Unit, Battery and bike parts. The key issue of an electric surrey bike is to get the Balance and make most use of each components. Sifonco Corporation, the supplier and manufacturer of Electric Surrey Quadricycles, Electric Surrey Bicycles.